WOW, do you see all these awesome cards? Aren't these something?!? Just fabulous. These cards are what was turned in for the card swap that ended the 28th of September. The fabulous customer card designers only had to follow a template, and from there they could let imagination rule. Some added a flowers, clips, circles or ribbons onto the basic template, others decorated their envelopes and one even made her own envelopes. Some have stamping, some don't. 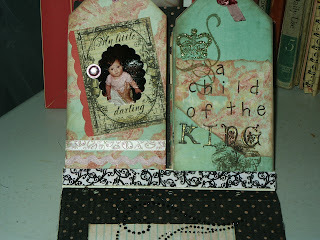 Some stamping is colored in with Gamisol, some with water color, some just pencils and some with jelly roll pens. Each card has such a different style and look from just one template! Do you want to know how you can get a set of cards like this? 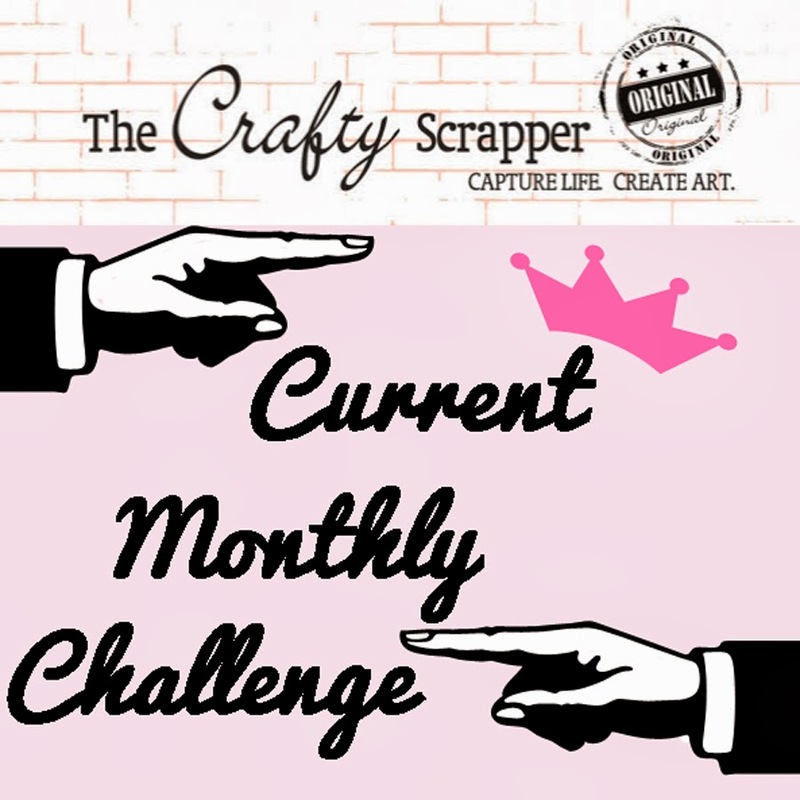 Join us in the next card swap! Here is the template for the cards and again--they can be any size with envelopes. 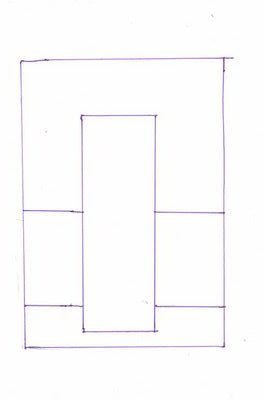 The design can be horizontal or vertical. You may use any paper styles or stamps that you desire. 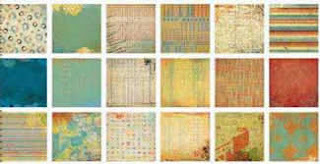 As you see, there was a variety of circles, ovals, squares, rectangles and even paw shapes on the last one for the center image. The next swap starts now and ends on November 3, 2007. It is so easy and FUN. It is a great way to get new cards, new ideas and for us to practice techniques that we are learning! To those participants who just turned cards in---Your swaps are at the store ready for you to pick up! Thanks so much for playing! Not many things are as fun as mixing up papers with a cute picture. This was a great picture of a group of folks in their costumes, looking like a band called the Halloween Treats. If you notice they each have the name of a treat on their guitars. Pieces of several lines of papers were used along with stickers and some hand stitching in a couple places on the edge of the picture. Easy to do, and eye popping with the 'chewed' out pieces of the black paper. This second layout has utilized some ephemera for added decoration. This is a fun idea especially if you happened to play a game like this at a party where the pictures were taken. 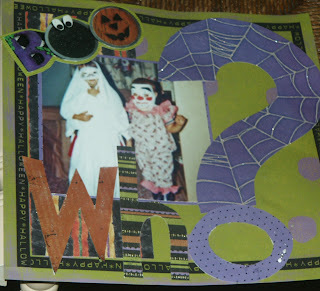 This one was filled in with words from the sticker embellishments from the Halloween lines. Multiple types of papers will work. If you are concerned with acidity, papers can always be sprayed with a coating that eliminates this problem. 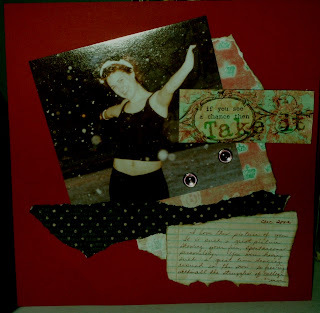 Last is a layout utilizing the space behind the picture for hidden journaling. Mixing colors from the Daisy D paper pad with more standard papers and colors is a fun way to make something unique. The Basic Grey Bookplate is a good pull tab for this journaling too.Come in and pick up some fun papers for your holiday layouts, cards or other projects. There are quite a few lines to choose from. All of the layouts in these posts are on display at the store as well. It is always better to see them in person--I think. 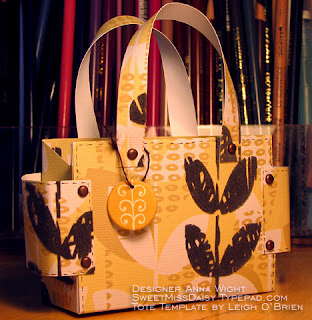 I wanted to make a wine tote using the Anna Griffin holiday line of papers and rub-ons, and this is what I came up with. I love the retro look of the papers, and wanted to feature the large design of the paper, but accent it with some of the smaller patterned papers in the line. I used a white glue to adhere the paper to the chipboard container. It worked well to hold the paper in place. I used a sanding file to trim the paper and give it a bit of a worn look. 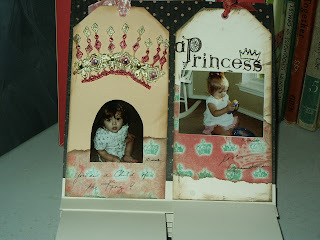 I used some bright pink May Arts ric rac that seemed perfect for an extra added embellishment. 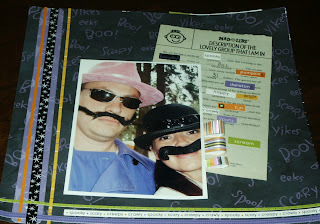 I found that the rub-ons that coordinate with this paper line are DELISH! They adhered to my project perfectly!! The colors really pop! This will be a great way to package a gift during the holidays. Oooh, can't WAIT! Check out this wine tote in the shop for a closer look! 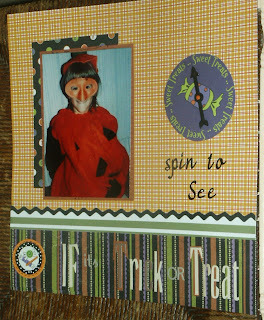 For a fun Halloween Layout, I used the new Curvy Cutter that can be attached together to cut out many shapes. They hook together kind of like a race car track does, then the cutter just glides along the tracks of the guide. The Question mark was fun, and is cut out and placed here on a 12 x 12 layout. These layouts use several different lines of paper, but they all blend together so well that it works great. I ran by the store today and saw that Carolyn had moved all the Halloween papers & embellishments to one section up front in the store. It is fun to see them all together and very easy to see how they can all be mixed and matched for multiple looks. I love mixing up the lines, so of course it was fun to do these. There are a lot of great fall papers too...I hope to play with those soon! If you were there, remember the fun. If you missed it, enjoy the pictures and plan to come next year!! Hi friends! Hope you've all had a great weekend - I know I have! I was able to catch up on a few projects I've had in mind. Yesterday I stopped in the shop to drop off some store display projects with Annette and I picked up a couple sheets of the new flocked SEI paper. Oh my GOSH, is this stuff fun! The darker areas on this paper are the flocked parts -- when you rub your fingers over it you can feel that it's fuzzy. I thought this paper would be PERFECT for a cute little box or bag - something special. Then I remembered that my friend Leigh made a super cute little tote template. I asked her permission to make her tote just for a store display, to show just how CUTE these papers are for 3D projects. I ended up altering her template a bit, but it's close enough to call it a "Leigh Tote". There are lots of tote templates available online; if you need one you'll find lots of samples here. PaperCrafts magazine had one in the spring of last year -- I found it here. Super cute, and so easy!! I also made a card using other papers in the flocked SEI line. I really like the graphic quality of the paper. Very 1960's ... they say everything that's old is new again. We see that true in papercrafts as well. I think it's great...but oh my, I think I can do without reliving the era of parachute pants and 80's hair. What's Going On At The Store These Days??? We are all keeping busy getting new products out, marking down older products, getting examples ready, working on swaps, preparing classes and planning for parties. This is a pretty long post, but LOTS of good information for everyone. September 28 is the deadline, so you have plenty of time to participate in this card swap. See the full information here. The basics: 7 cards at the store by the 28th following the template. SO easy! Prayer Journal: September 27, 29 and October 13. 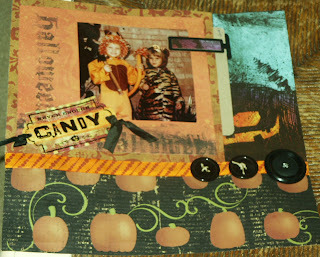 Trick OR Treat altered book: October 25 and 27. Join us for a spooky time of altered creations! We'll us the fabulous K&Co halloween papers and an old, creaky book (our treat to you). You'll learn how to transform an ordinary hardback book into a spook-tactular masterpiece! Bring your class kit and a craft knife, eyelet setter, liquid glue, and ultra-strong tape (like terrifically tacky tape). Here are pictures of the neat book. School Daze: November 1 and 3. Want an album with a descriptive overview of each of your child's school years? 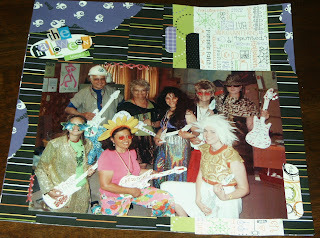 We will use Rusty Pickle School Daze papers and a hearty Maya Road album to make this treasured keepsake. You'll have room for school pictures, class schedules, favorite things, etc. For each school year! The Luxe Design Jotters add the perfect journaling touch. Fun!! Bring class kit. We will post pictures as it gets closer to the dates. Christmas Card Mania: November 15 and 17. 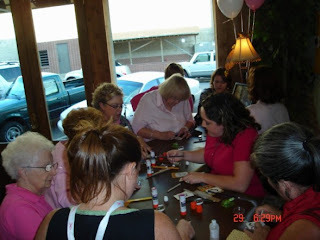 Our usual card class on steroids! 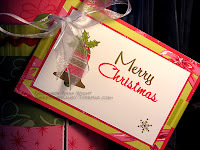 We will use the beautiful Crafty Secrets Vintage Christmas stamps to create cards worth your every Christmas wish. We will try techniques that will leave your card recipients breathless. Crackled glass effects, watercolor, and so much more. Don't miss it! Bring class kit, ink pads, eyelet setter. Pictures will follow later on these too. More classes will be announced as we get them set up. Halloween Costume Party is the theme of the next all day crop. Sign up a the store & start getting your costume ready. There will be food catered by College Street Pub and lots of fun people. The party is October 20, 2007, all day from 10 am to Midnight. Prizes for best costume. Check out this awesome Project to make and take!! 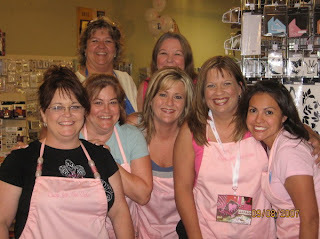 The design team was asked to develop make and takes for the Crop for the Cure which was Saturday at the store. All of the projects were to be in the theme of "cooking for the cure". The participants all expressed positive things about the make and takes. The new 'bar' at the front of the store was the perfect height for doing these projects. 7 people at a time could work on items at the bar. Luxe Designs was great to donate a full make and take which Annette & Carolyn shared with the croppers. 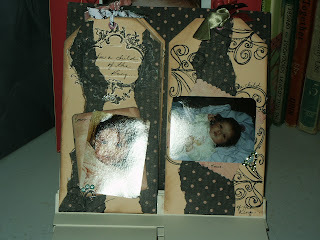 The card used jotters, rub ons and some papers from their Pashmina line for these cute cards. Aimee set up a great card using the clear stamps from Crafty Secrets and taught use of colored pencils with Gamisol to color in the scrappers choice of stamped image and used the same stamps to stamp a little expression on the card as well. 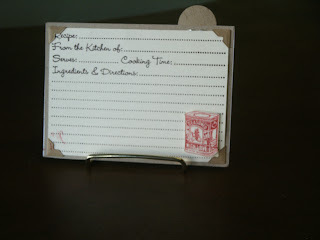 Joanna also used kitchen stamps from Crafty Secrets. For the project she designed, the scrappers cut out the images and attached them to one side of the recipe card. 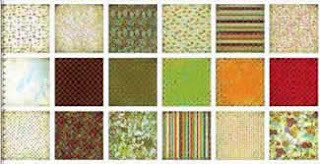 The design used the Flair kitchen papers. It was another wonderful design. The design team is looking forward to being involved more in events such as this to share techniques and new products. Let us know in comments your thoughts on these projects. What an exciting day Saturday. 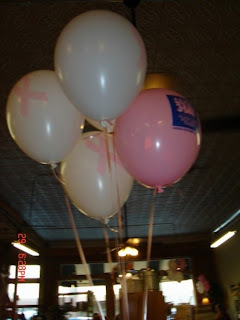 Pink and White balloons greeted everyone out in front of the Crafty Scrapper Store on Saturday morning. Inside were even more balloons. Tables were set up throughout the store for the 56 scrappers who were coming. 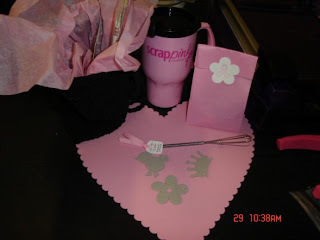 Each place setting had a Bazzill pink scalloped heart shaped card stock paper , a few chipboard shapes from Maya Roads, a pink travel mug, a beater, and a crocheted black backpack purse filled with goodies like Bo Bunny pink pencils and Flair pink velvet ribbon. Most of the goodies were donated by the manufacturers. Carolyn or Isla donated many supplies too! Through the day, there were four make and takes to participate in. Attendees were treated with a card made from Luxe Papers (the supplies were donated by Luxe Designs). 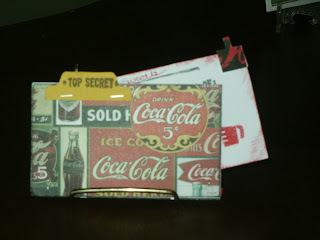 They made a little file folder/recipe card with a Coca Cola theme. The third make and take was learning to use Gamisol and colored pencils to color in a stamp. The cute Crafty Secrets Tea & Coffee Stamps were used for this. 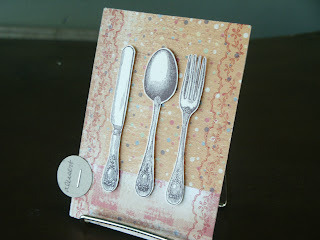 The last one of the day was another adorable recipe card, using the flair papers and stamps of a knife, fork and spoon from the Crafty Secrets kitchen stamps. All of the projects were in the them of "Cooking for the Cure". The College Street Pub donated dinner for everyone-a wonderful enchilada dinner. Also, throughout the day, there were raffle drawings for many wonderful prizes donated by various sources including Dove's Nest Restaurant and Gift Shop, The Cozy Cottage, The Chamber of Commerce of Waxahachie, Luxe Designs, Rusty Pickle, and of course Carolyn and Isla. Additionally, there were wonderful name tags made by each attendee and prizes were given for the most popular tags. They were quite amazing tags. Thanks for all the participation. Congratulations to all the winners. Thanks to all who participated and we hope you had a wonderful time! 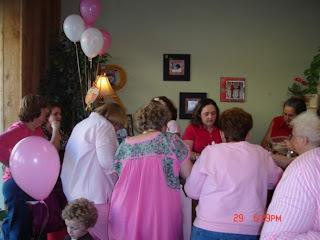 Best of all, over $3000.00 were raised for the Breast Cancer cause. 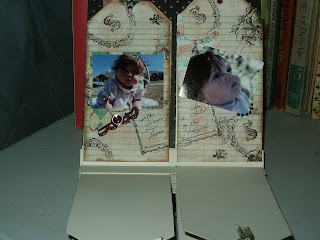 After making the mini book I had a few scraps left over and decided to make a quick layout with them. For the background paper, I used a coral card stock paper, a little darker coral than the coral of the paper line. The paper line from Prima has these great chipboard accents and this picture of my daughter seemed to fit the saying on the chipboard to me. She is out in snow in Maryland, taking advantage of it since we don't see that much in Texas and certainly not a snow fall like this one. The whole paper line is fun, and perfect for any adventure, dream or moment in your lives. Be sure to check out the whole line, as I have only used a fourth of what the line includes in paper, not to mention all the great embellishments. The line also has some neat paper that can be used as is in black and white or colored in by the user for use. I got these great letters at The Crafty Scrapper a while back. 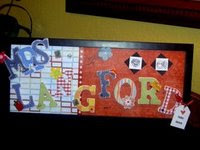 My mission last week was to make these name plaques for the 3rd grade teachers at the school where my daughter teaches. I used a long wooden frame and took the glass out. Then I just covered the background with papers to make my "palette". I covered the letters with random scrap papers, sanded them, drew on them, embellished them and then just started gluing them on. I loved putting on all the doo dads, flowers and the such and suches. I did 5 of these and even though they took a while to make, it was worth it. The teachers loved their gifts. 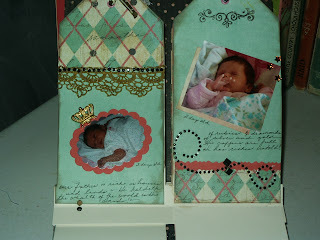 My project this week was this great tag book made by Memo Designs. It is called a tag flag mini book. The book is a really nice size-about 7 x 7 inches or so. There are 12 tags in the book. It is put together kind of like an expandable folder and there is room to add pages if one desired. I thought it might make a really cute book for alphabet tags, an unusual baby book, a 12 days of Christmas book and other fun things. Deciding what I would do with it took a little time. 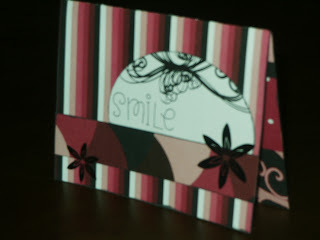 The papers I was given to work with are these awesome papers from Prima Marketing called Iron Orchid Designs. I used 4 out of about 12 in the line. They are really nice for so many things. I decided to do a little book for my grand-daughter with the book and these papers. The cover is made from both sides of one of the papers. The flower design is a black and white and the small dots are the flip side. I used a scoring blade on the cover since I wanted to put a binding on the spine of the book. It folds/opens better when using a binding this way. I used an Autumn Leaves Stamp for the crown and put Stickles & little sticky rhinestones on it. 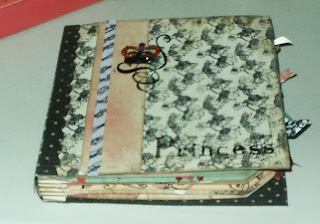 At the bottom of the cover is stamped PRINCESS with Crafty Secrets Stamps. I used the polka dot side for the inside of the cover. I used scallop scissors on the one side of the paper for a different look to the binding and placed a piece of ribbon on the soft peach paper. Then I started on the tags. I have them all facing the same way, but it would be very cute with the tags in different orientations. In the collection of papers are these journaling papers that come in a box like memo paper and are perfect for jotting things down & then posting in a layout or like I did here, behind a picture. On the crown stamp, I used some gold Stickles to color it in. I also put a piece of ribbon at the base of the tags on the book fold just for a more finished look to the page. The floral-ish paper and the neat green color on these tags are both sides of one paper. On these tags I used some fabulous new lacy ribbons & black rhinestones from Prima, along with Autumn Leaves Stamps and Marvy Punches on the Iron Orchid Papers. The opposite side of this argyle paper is the soft peach I used on the cover. This paper is just covered in crowns. The colors are a really pretty coral and a neat green color. 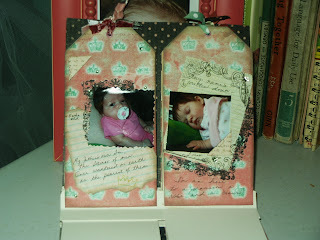 I used the Iron Orchid RubOns behind the pictures and another journaling paper. I have also used the Crop-a-dile to put in eyelets on each tag and used some various ribbons at the top of each tag. They stick out just barely when the book is closed. For these pages, the paper is torn and then one has a RubOn over it, the other has Autumn Leaves Swirl Stamps behind the pictures. 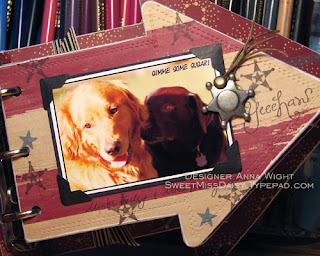 Chipboard photo corners also adorn the pages. This lined paper is the opposite side of the cute crown paper. 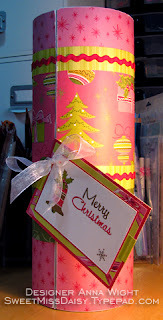 I stamped on it with various stamps and used a RubOn as well. I attached a little bit of ribbon with a brad to the page. There are little rhinestones here and there on the pages & little brads too. You can also see in this picture how the tags are attached to the accordion back of this book. It would be fun to do both sides or as I said, even insert a page on these folds. More Ribbon and Stamps with pieces of paper are on these tags. This is another piece of the fabulous Prima Ribbon. The inside of the back cover is the polka dot paper you see behind the tags here. Another fun and successful family night at Chick-fil-A! The kids had a blast decorating these mini composition books. They use patterned paper, punches, stamps, ink, colored pencils, markers, glue and scissors. The punches and stamps were especially big hits! Carolyn, Aimee, Annette, and our great helper, Kaitlyn, worked with the kids to produce their mini-masterpieces. Hey, there are some true aspiring artists out there. 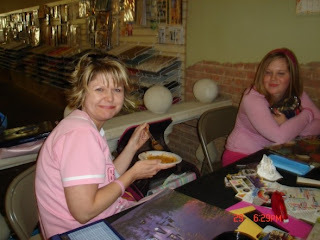 And now they know a little more about the wonderful art of scrapbooking! Here's another project I have to share with you! You'll want to check out the new K&Company Halloween paper & embellishments Carolyn ordered for the store! The bright colors and cute characters are so perfect for a whimsical Halloween! I wanted to alter a clear paint can and these papers just screamed to me for the project. It takes a bit more than 12 inches in length to go around small paint can so make sure you're prepared with plenty of paper. I found that double-sided red sticky tape works great to adhere the paper to the plastic bucket. AND it also holds ribbon in place perfectly! I know the idea of altering paint cans has been around for a while, but this is the first time I've done one -- and now, I just want to do more! I have so many ideas for packaging up the gifts I send to my girlfriends during the holidays! If you've never altered a paint can (clear or regular), don't wait any longer! I know you'll have fun with this project! 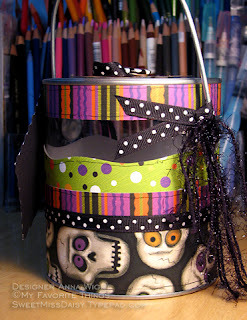 You can see my Trick-or-Treat can on display at The Crafty Scrapper! Last week Carolyn put me to work on a Maya Road Arrow Album. I decided to make it a book about my two dogs, Mister Farley and Miss Daisy. They really are best friends -- inseparable! They go everywhere together... even the vet's office! I used Hideaway Cafe patterned paper by Cosmo Cricket for the cover and all of the pages, and matted all of the photos with black cardstock. 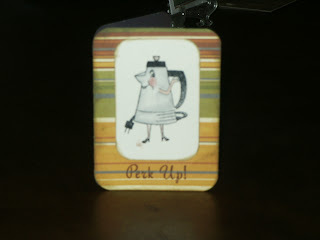 I used a couple of stamps by Stampin' Up, and by A Muse Art Stamps. Each page has unique embellishments (charms, buttons, eyelets, etc) but using the patterned paper series throughout the album really pulled the project together. 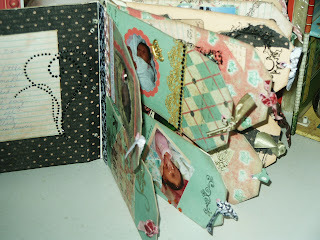 You can see the entire album at The Crafty Scrapper, and here in my personal gallery. Enjoy!! =) -Anna. The Marah Johnson Rock Star Line is HERE. Here is a little look at the Basic Grey Recess Line, the die cuts from this line are adorable. Here is a little look at the Basic Grey Mellow Line, the die cuts from this line are cute too! The K&CO Halloween is really cute. Little furry spiders, spiders with eye, jack-o-lanterns, witches...all sparkly & fun. You can see it here or just come into the store. Come on in and see it ALL.